Families who want to save on airfare should watch out for checked baggage fees. These fees are typically $25 or $30 per checked bag, which could add up to hundreds of dollars for a family on a round-trip flight. 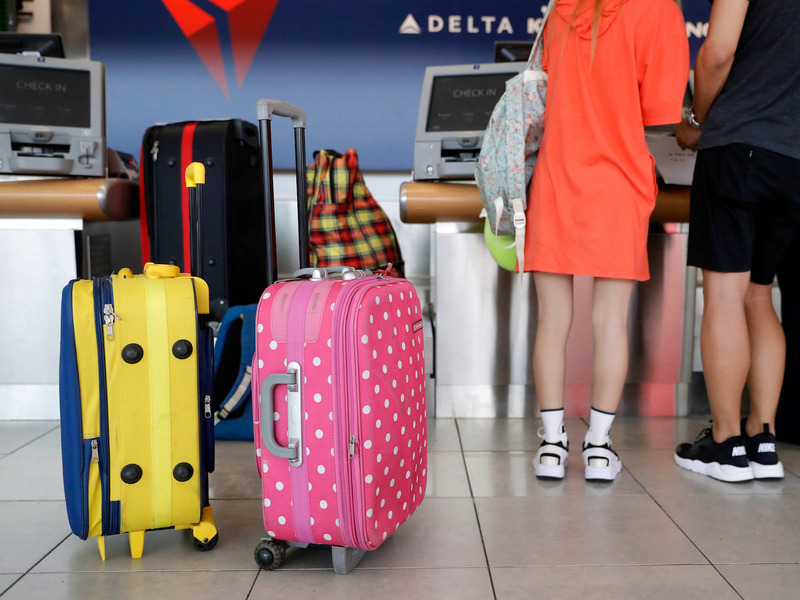 There are numerous ways to avoid the costs of checked bags, including flying airlines that don’t charge fees for bags and packing carry-on luggage only. Also consider the prospect of signing up for an airline credit card that lets bags fly free. There are numerous options available, and many offer a huge welcome bonuses when you sign up. From now until April 3, Delta’s three main credit cards are offering their highest-ever bonuses. If you have a Delta credit card, you and as many as eight travel companions will get free checked bags. The hidden costs of air travel can add up if you’re not careful. Maybe you forget about airport parking fees, buy a few magazines for the ride, and treat yourself to a cocktail once you’re in the air. Within the span of a few hours, the cost of your flight goes from affordable to a tad pricey, ruining your travel budget in the process. While airport coffee and snacks are obvious extras to avoid, another hidden cost to be aware of is the price of checked baggage. Some airlines do indeed let bags fly for free, but others charge exorbitant amounts if you want to bring more than a backpack or personal item. If you want to save money, you need to know the difference along with the many other hacks you can use to save on checked baggage. Saving on checked bags is especially important if you have kids in tow or a big travel party. Forking over $25 for a single checked bag may not ruin your travel budget, but what if you check bags for your family of four? And for every single leg of your trip? You could easily wind up paying $200 or more in checked baggage fees — that’s what. If you want to check bags freely without worrying about the cost, look for an airline that doesn’t charge baggage fees. Southwest Airlines is the most popular option in this realm (and sometimes the only option!) since they let each flyer check two bags for free. This is one of the reasons Southwest is so insanely popular with families, along with the fact that their flights are affordable. While Southwest is known for offering affordable domestic flights, don’t forget that the discount airline also flies to Mexico and the Caribbean. This means you could save big money flying to destinations like Aruba, Turks and Caicos, and Jamaica, plus get two checked bags per person for free. You can also consider picking up an airline credit card that offers free checked bags, although this strategy works best if you typically only fly with that airline. If you fly with American Airlines on the regular, for example, you can pick up the Citi/AAdvantage Platinum Select World Elite Mastercard to score elite benefits such as priority boarding, 25% off in-flight purchases, and free checked bags for you and up to four travel companions on your reservation. Fly Delta instead? Consider the Gold Delta SkyMiles® Credit Card from American Express to get similar benefits — priority boarding, 20% discount on in-flight purchases, and a first checked bag on Delta flights for you and up to eight travel companions. The Gold Delta AmEx also currently offers a big, limited-time welcome bonus of 60,000 SkyMiles when you spend $2,000 in your first three months, so make sure to check it out before the deal ends on April 3. The reality is, most major airlines offer a co-branded airline credit card that grants you and a certain number of companions a free checked bag. Make sure to check your airline’s offerings so you know for sure. Some travel credit cards also offer annual airline credits that can be used for travel incidentals such as checked baggage fees. The Hilton Honors Aspire from American Express, The Platinum Card® from American Express, American Express® Gold Card, and the Chase Sapphire Reserve are popular options that offer this benefit. Just note that some cards require you to specify an airline for your travel credit. The Chase Sapphire Reserve travel credit is good for any travel expense you make during the year, but the Hilton Aspire, AmEx Gold, and AmEx Platinum Card require you to select an airline by the end of January each year. Some airline frequent-flyer programs let elite members avoid paying for checked baggage. For example, American AAdvantage Gold members get one checked bag for free while Platinum and Platinum Pro members get two free checked bags. Executive Platinum members get up to three checked bags with no fee required. Delta Medallion members also received waived checked baggage fees for themselves and up to nine travel companions on their reservation, depending on their status. Whether you fly Southwest to avoid paying for checked baggage or use elite status or an airline credit card to avoid the added cost, you do have to remember that these perks only apply to luggage under certain weight limits. Most domestic airlines set the limit at 50 pounds for checked baggage and they’ll charge more for baggage that exceeds this weight limit — even if you have a free checked baggage perk. If you tend to pack a lot of heavy items, make sure your baggage doesn’t exceed weight limits before you leave the airport. You may get mixed results if you try to weigh large suitcases on your personal scale. We suggest picking up a luggage scale on Amazon for $12. Finally, you can avoid paying for checked baggage if you’re able to pack everything you need in a standard carry-on-size bag. Make sure to check your airline’s terms and conditions to note their limits for carry-on luggage, then pack strategically to ensure all your items will fit. There are a ton of strategies people swear by to pack lighter and fit more into their suitcases, including using packing cubes, “rolling” all their clothing, and choosing luggage with various compartments. However, you’ll almost always need to pack less if you want to avoid paying for checked bags. This may be a chore when you’re traveling as a family, but it’s not impossible. Also note that you are generally able to bring a personal item on the plane in addition to your carry-on bag. This could be a briefcase, a smaller handheld bag, a backpack, or a purse provided it is small enough to fit beneath the seat in front of you. Click here to learn more about Chase Sapphire Reserve card from Insider Picks’ partner: The Points Guy. Click here to learn more about the Citi/AAdvantage Platinum Select World Elite Mastercard from Insider Picks’ partner: The Points Guy. Click here to learn more about the Gold Delta SkyMiles Credit Card from American Express from Insider Picks’ partner: The Points Guy. Click here to learn more about the Hilton Honors Aspire Card from American Express from Insider Picks’ partner: The Points Guy. Click here to learn more about the Platinum Card from American Express from Insider Picks’ partner: The Points Guy. * This content is not provided by card issuers. Any opinions, analyses, reviews, or recommendations expressed here are those of the author’s alone, and have not been reviewed, approved or otherwise endorsed by the card issuer.